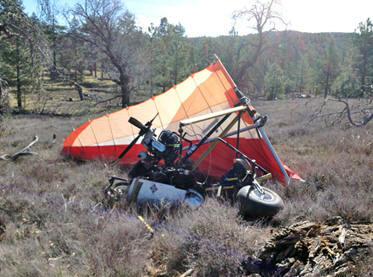 March 21, 2014San - U.S. authorities are investigating a drug smuggling incident in the Laguna Mountains east of San Diego early Friday morning involving an ultralight aircraft carrying approximately 250 pounds of marijuana that crashed into a dead oak tree. The downed aircraft was discovered shortly before 9 a.m. by officers from U.S. Customs and Border Protection's (CBP) Office of Air and Marine during a routine patrol operation. A team of federal agents from U.S. Immigration and Customs Enforcement's (ICE) Homeland Security Investigations (HSI) and CPB's U.S. Border Patrol was immediately dispatched to the site, located at an elevation of approximately 4,000 feet in a remote area of eastern San Diego County. At the crash site, authorities found evidence of the pilot, including discarded gear and a single pair of footprints leading away from the scene. There were no traces of blood, leading authorities to believe the pilot walked away without serious injury. Agents have removed the marijuana from the aircraft wreckage. "HSI agents in San Diego are aggressively pursuing leads involving the dangerous use of ultralight aircraft to smuggle small loads of drugs across the U.S. - Mexico border," said Mike Carney, acting special agent in charge for HSI San Diego. "From all indications, the pilot in this instance escaped relatively unscathed, but that doesn't diminish the serious danger posed by ultralight smuggling activity in general." All of the evidence found at the scene, including a helmet, gloves and other equipment, is being processed and the investigation by HSI agents assigned to the agency's Border Enforcement Security Taskforce's Air Investigations group remains ongoing.